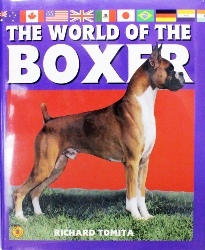 My book, The World of the Boxer, although almost 17 years old now and almost 600 pages long, is still the “go to” Boxer book when it comes to Breeding, Whelping, Puppy Selection and just about any other Boxer topic you might need information about as well as what Boxers look like in other countries and important kennels. The information about Boxer kennels alone is really staggering. It took me almost 8 years to write the book and the amount of information it contains can be found nowhere else. New copies can still be found on Amazon as well as used copies. It’s decidedly a “must own” book!. Click here to the Amazon Link. I originally wrote this book as an aid to families owning a new Boxer or thinking of acquiring one. It’s a very helpful book particularly for the new Boxer owner. It’s about 150 pages long and the chapters on health care, behavior, puppy training, obedience and showing are really excellent. It’s still available from sellers on Amazon and you can get it from Amazon by clicking here. It will answer a lot of those questions that you’re never sure whom to ask and it can be purchased quite inexpensively. Rick Tomita's World of The Boxer is the BEST book I have ever read/owned, since Billie McFadden's publication! Rick's expertise is totally phenomenal & the content of this entire book is extremely comprehensive, well articulated, and offers a seasoned, as well as a potentially new Boxer owner the "MOST REALISTIC & OBJECTIVE DESCRIPTION" of this very special breed. Author Tomita is a virtual "ANGEL OF THE BOXER BREED" and his sharing of his knowledge is far beyond what any other author has done -EVER ! I have been reading books about this breed for the past 20 years, & to say that his is the best book ever to be published is an understatement! has done -EVER ! I have been reading books about this breed for the past 20 years, & to say that his is the best book ever to be published is an understatement! 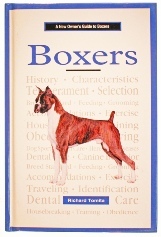 This book is great for all levels of interest in the breed of the Boxer dog. My Parents and I have bred and shown Bea-Mar-Ton's Boxers since 1953 and the book is full of information that interests me. It is a powerhouse of beautiful pictures of great boxers from the past as well as from the present. This book has a wealth of information that will enlighten anyone from someone thinking of owning a Boxer,to the pet Boxer owner, and even those who breed and show Boxers.